The doc loves these boot socks from Purl Bee (and so do I!). I’ve made a couple pairs for him–they are perfectly bulky for those freezing, winter days. And because they are knit in worsted weight yarn, you can make a pair in one sitting, pretty much. Sometimes they take two days, but in the world of socks, that’s great timing. The color combinations are endless and you can use scraps of yarn for the heels and toes–something I often have just enough of not to want to get rid of but not much else I can do with them. The doc lucks out–more boot socks. I have since knit him a DK weight Madelinetosh version for Valentine’s Day; stay tuned for those. These boot socks are knit using Malabrigo Rios in azul profundo for the main and little bits of Rios in glazed carrot for the heels and toes. He’s since worn them a pile and they still look killer. See more of my boot socks here. Check out my ravelry project notes here. f.o. | baby hats + socks. Some little Purl Bee baby knits for an old friend that recently had her second child. This is the garter stitch baby hat and the baby socks from Last Minute Knitted Gifts. Purl Bee has the best patterns for babies. Simple, gender neutral, soft, adorable, tiny. They are my go to source and I tend to knit every new baby I know a version of this hat and these socks. Knit up using odds and ends of Madelinetosh Tosh Vintage in the whiskers colorway, and Juniper Moon Farm Moonshine in flan. Some Malabrigo Merino Worsted in ravelry red for the tassel on top. This project was a complete stash buster–my favorite! This summer has been a kind of breather, for me. I had this moment in between employment, where I was looking to completely unplug and connect with relaxation, respite, passions. And for some reason, that meant leaving the sticks in the field bag. I did very little, if any knitting, during this time. I often feel a creative pull toward one kind of making or another–I work in fits and starts, focus entirely on fiber, or ink, or the stove, for instance. But this summer, for some reason, I was lost in books and left little room for anything else. I didn’t make much. I never touched the computer or the blogs. And it felt good. But, as I find summer winding down and I’m back in my work groove, I’ve been yearning for evening creative outlets that take little energy and can be enjoyed on the back porch or on the couch; things like knitting, that I can do with my eyes closed. Of course, it could just be that it will soon, again, be time for scarves, hats, sweaters, and cozy socks, here in Boston, and maybe that’s why I’m back to knitting. Anyways, these will be a pair of neon green socks for the doc. I haven’t made him a pair since his birthday last April, and had some pretty luxurious yarn just waiting for feet. These are a simple 3×1 rib with a pop of color on the toe and afterthought heel–my favorite kind of socks to crank out. Finished snaps in the coming days, as I’m winding down on the second sock. Here’s to more creative making this fall. What are you creating? This is the second Elwood I have knit this spring. The first time around, it was for a colleague having her first kid. This time, it’s for my third nephew, who was born last week, and I finished the cardigan about a week before the (early) due date. 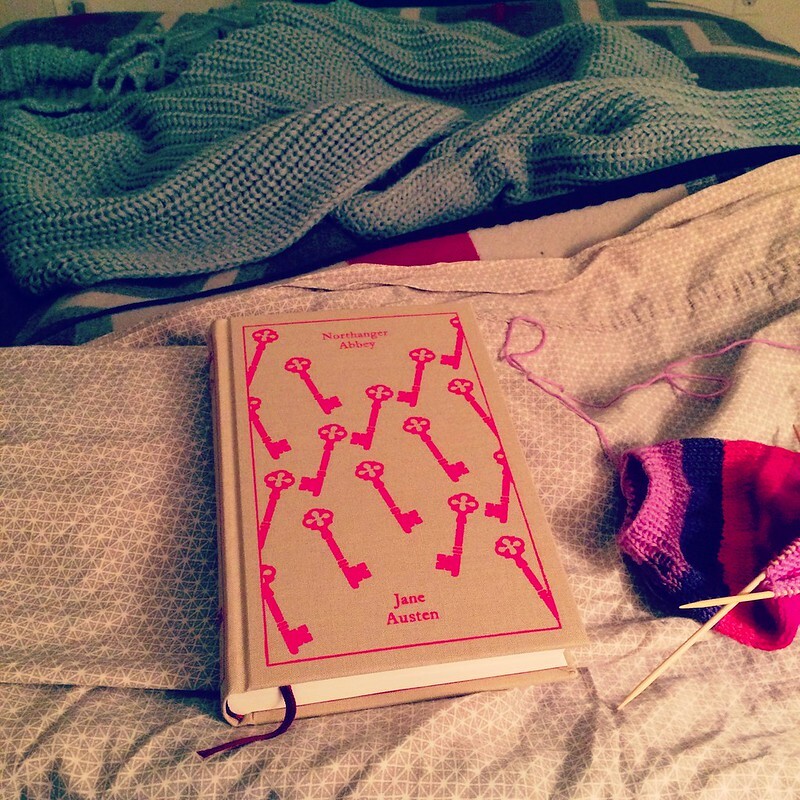 It is such a quick knit with endless rewards. If you are looking for a grandpa style cardigan for a small person in your life–this is the sweater. And, you can make a matching one for yourself, if that’s your jam–adult sizes are included in the pattern. I settled on a blue and orange striped one, after seeing another in a similar color on ravelry and being smitten with the pops of color. I used two skeins of Malabrigo Rios (super wash merino wool is the best way to go for babies and busy moms) in the azul profundo and glazed carrot colorways. The six month size called for two skeins of the main color, but I didn’t use the second skein. While normally I’d be annoyed by this, it’s a great, and versatile worsted weight yarn. It will become a winter hat, or matching accessories for baby, soon. See my pattern notes here. Check out more of my baby knits here. I have been wanting to knit a Camilla Babe by Carrie Bostick Hoge for awhile now–but everyone I would knit for with child had boys or live in deserts, and while I’m very much anti gender specific colors or clothes, this feather and fan lace detail on the front, no matter in what yarn, felt too feminine for me to pull off for any babe but girl. And then a colleague with child told me she was having a girl. But, I’d already knit her some booties, a hat, and a little striped t shirt sweater since its a July baby. While sitting around avoiding a project that’s languished, I looked at the skeins of Madelinetosh Tosh Vintage in the Filtered Light colorway I had laying around, and boom, I started knitting the Camilla Babe, a Madder Root pattern. It took two evenings to finish this sweater–the 3 months size–and it lives up to every idea I had about how it would look. The pattern is so easy to memorize; I’m thinking of making one for myself. And so, that colleague, will get an extra special bonus hand knit. Maybe she will think I’m crazy? The doc loves my hand knit socks. He wears them almost religiously, until its swamp summer climates. And every holiday, birthday, celebration, or just because, I make him a pair. He’s amassed quite the collection. A lot of them have been phased out of wear because I won’t darn holes in socks. That’s the wear they get. Here is his 34th birthday socks, gifted to him yesterday. These are a classic after thought heel sock (perfect for self-striping sock yarn), knit up in Quaere Fibre sock in the snips and snails colorway. Aren’t they gorgeous? I definitely want to know a few more pairs with this yarn–hand dyed by a Rhode Island based fiber artist. Grab some! You won’t be disappointed. Here are my project notes. This is the Gray Street cowl I gifted my mum this Christmas. I used three skeins of Quince and Co. Puffin in sabine, kittywake, and iceland. I love how it came out and it’s a really quick knit on account of the bulky yarn and large needles. I can see endless color options, too. I chose these colors because they were almost all featured in the original pattern and match the black down jacket my mum wears most in winter. See my project notes here. Check out more snaps here. This time last year, I made Avery for mum. I splurged and got some of those incredible Madelinetosh speckled skeins, in the tosh vintage. This is from left to right “Filtered Light” and “Holi Festival”. I know the knitting community is abuzz about these colorways, but I have seen few finished products on ravelry in the vintage version–but definitely plenty in the tosh lite. The color at right is going to be a hat and maybe some mittens, too, for my sister in law for Christmas. The Filtered Light very well might be a basic crew neck sweater for me–if it swatches nicely. To match that Purl Bee garter flap had I knit the other day. I decided to use my favorite baby sock pattern–Joelle Hoverson’s baby socks from More Last Minute Knitted Gifts. I’ve used it in the past to great results. This time around, I wanted the socks to not just match the hat, but I wanted them to feel playful and fit for a new baby. We all know how much I love the pop of color in a toe. Well, why not for baby socks, too? These were knit up using the Madelinetosh Tosh Vintage in the thyme colorway I used for the hat. It also features the golden ochre in Malabrigo Merino Worsted for the toe detail, just like the pom did in the hat. I love little projects. Not only did I finished these in about an hour last night whilst watching television, I get to dig into my stash and use up small bits of yarn. See more snaps of the socks, and all of my baby knits, here. Project notes here. 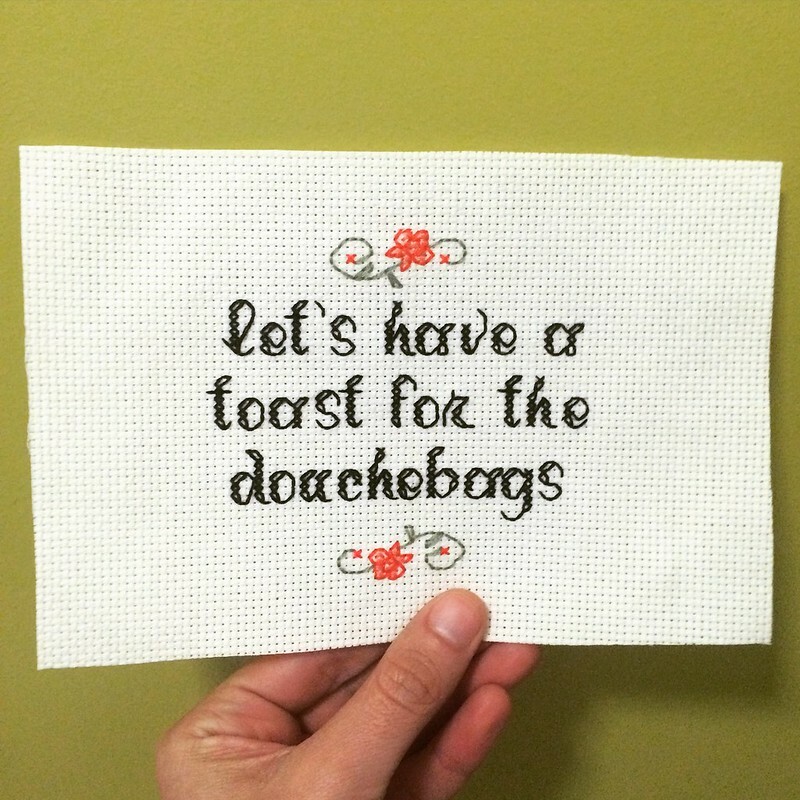 I stitched up this hilarious cross stitch pattern for my good friend Mackenzie, in honor of her 31st birthday. She’s a K. West fan and a lover of all juxtaposition; this seemingly antique feeling stitchery and script made for the perfect marriage to a 21st century rap lyric. She loved it. Framed and gifted. Here’s a snap of it before framing. You can purchase the pattern from Raging Stitches here. 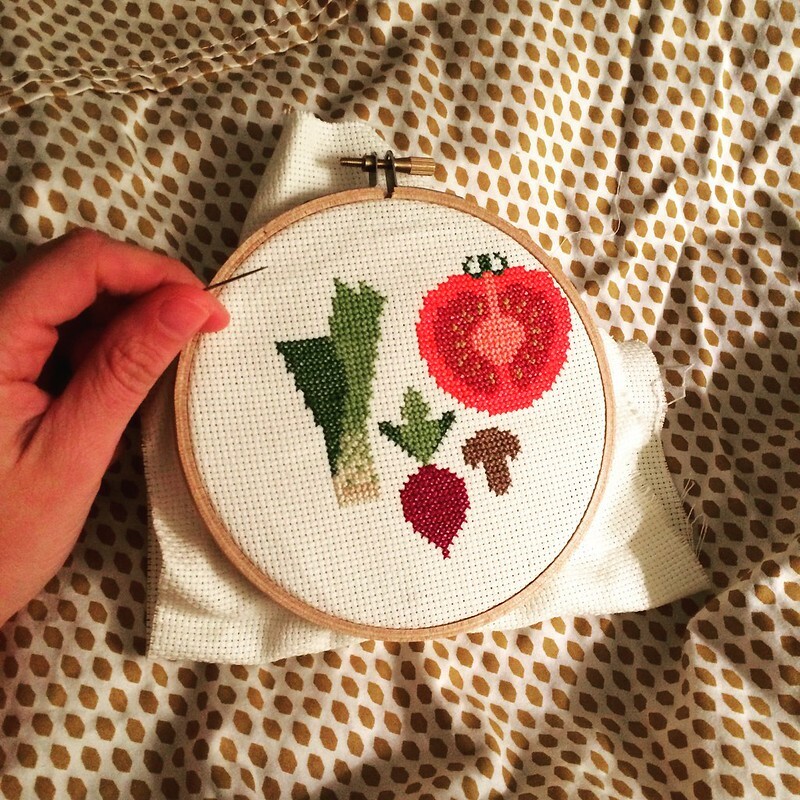 Working away on this vegetable sampler to frame for my mum on Mother’s Day. She said she wanted color in her self described “boring” lake house kitchen–with a vintage feel. So what better than a handmade gift that tries to do just that? Here’s to hoping I actually have it finished. My nights these days are filled with pleasure reads, decorating magazines, and small gifts for my guy’s upcoming birthday. He is the only person I know that can confidently walk into 32 years old wearing pink striped socks.